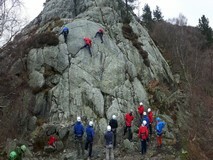 This is a 5 day introduction to rock climbing in a single pitch environment. The content includes clothing and equipment, access and conservation, weather, care and use of equipment, rope management and knot tying, belaying techniques, climbing techniques, single pitch climbing, abseiling, setting up belays, gear placement/protection. The outcome is for the candidate to be a competent rock climber in an outdoor single pitch environment.